This website is dedicated to all the men and women of Class 1980 of the University of Santo Tomas High School. This site showcases the fun and nostalgia of the best batch USTHS has ever produced. SANGKALAN, QC, November 24, 2007. Sangkalan 2001 was a first, and it was a memorable first. Two decades after high school, and in preparation for its silver jubilee, members found valid reason to come and check out one another. 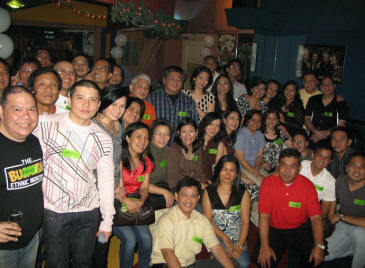 This 2001 event signaled the start of a continuing chain of reunions that will see members of this class- party, reacquaint, work, and grow together. And what growth we have had! Thus, this Sangkalan 2007, is a sentimental visit…to that place that saw us birthed, where many of us first gathered, and where this compelling desire to assemble this group and make it relevant to its members was conceived. Six years after, we came back to say – once more, with feeling! That Saturday night, a supertyphoon threatened to rain on our show but it could not dampen the expected downpour of members for our annual Christmas parade. Confidently the organizers prayed for and expected fair weather, good food and a good turn out. If there were misgivings, it quickly vanished soon as batchmates started piling in. In fact, clear starry night outside was matched by the growing firmament in that dimly-lit room. The sparkle of the night was no longer of the honeymoon quality; moonshines have long been dispelled as we have been playing and working alongside each other all these six years. We have seen each other’s glummer side and have exposed ours too. Less romantic and more realistic, we have grown quite comfortable with each other. We have made this USTHS80 AAI our second home where we can let it all hang. In a nutshell – it was one rousing success! Was it because of the free booze? No. Although free, people drank and paid up. Where last year we had a deficit, this time we had a surplus! No, it was not the booze. It was of a better spirit. It was a night of boisterous singing and dancing and most everyone with a song and a skip in their hearts sang and danced. It was FUN, that night, we were one. The impromptu program sent everyone to their feet either to sing, dance, or simply to table-hop. There were snafus but the improvised games held, the batch t-shirts distributed, the magician’s tricks transfixed and entertained and the singing continued till the early morn. There was this all prevailing drone; a cacophony of happy sounds. Food was plentiful, satisfying and generous. As in everything that night! We were generous in our pleasure and generous in our giving, and where there is giving there sure is loving. When the President stood to deliver her annual report, the entire body cheered for a year well served. For the health of the whole is the health of the parts. We reviewed our gains, acknowledged the valuable contributions of many and confidently look forward to the coming year. Unshakeable we seemed that night. And are we as a group, unshakeable? For as long as we know our purpose and the methods with which to achieve it, for as long as we hold on to our sense of proportion, valuing this group and fitting it correctly into our priorities, for as long as we endeavor to learn to put others before us – yes, we can be more than that! As opening, I just want to send thanks to Robert who hosted the mini-reunion ... we all had a great time, great food, not to mention a great place. Robert indeed is the host who thought of nothing short, making sure we all had the best time -- from the music entertainment (complete with piano, projector, karaoke and concert DVDs) and the accommodation! Great comedic timing from Rommel & Dennis! What a tandem! What can i say? It was one of the best time ever I had in a longgggggggg time. Got home tonight and still humming all the songs we did while Iris played the piano. As entertainment, Elmer sang songs while Iris played the piano! They looked so good together, Rommel came up with an idea of putting a fund-raising event with this two together -- o say, niyo? We all got together as it didn't matter which section we belong to or which barkada, my feelings were parang di lumipas ang 27 years. As Iris said 31 yrs technically because most of us didn't really hang out in highschool for 4 years. Amazing the connection we all had. Starting from Robert who made sure that we all had the best time ever...and Dennis who was always willing to take us in and out of Virginia to DC pati na rin si Kiko (hubby ni Luchie) grilled the chicken inasal while Gina (Rommel's wife) all of a sudden became the official photographer. Joey Estanislao came with a fully equipped camera and took lots of pics. Galing din kumanta ni Joey. 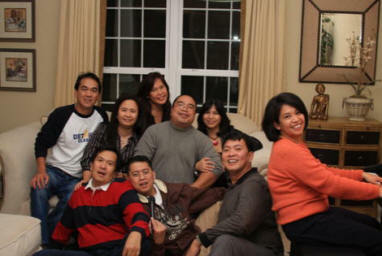 You should hear all of them sing, pang showbiz ang dating! Not to mention Rommel, Elmer and Joey are such good dancers. It was indeed one of my best time ever, it was indeed all worth it for me! HOMEBASE: At home with Allan Jauregi in Las Vegas. Nalagan's Manila residence in June 2007. Concon in San Francisco July 2007. Ompong and Robert in Manila July 2007. SPOTLIGHT: A collection of press clippings of batchmates. ADVENTURE: Mission Death Valley - Just when we thought it was impossible, the FBS team finally hiked the valley of sweat and tears. Yna's Philippine Star Article about the Batch and Child house. USTHS80 Board releases guidelines on Scholarship grant. USTHS80 President Yna releases 2007 Plans. Congratulations to our batchmate JOBET MORALES for being one of The Outstanding Thomasian Alumni (TOTAL) Awardees for 2007. Awarding ceremony was held on August 18, 2007 at the UST Central Seminary 6PM.